We’d love your help. Let us know what’s wrong with this preview of The Duchess of Windsor and Other Friends by Diana Mitford Mosley. Diana Mosley is the last intimate friend of the Duchess of Windsor still alive. In this revised and updated biography, she addresses the latest allegations of secret service reports about the Windsors' conduct during the war and the abdication. A new chapter has been added. To ask other readers questions about The Duchess of Windsor and Other Friends, please sign up. I read this due to a combination of low motives; I read a great deal about Edward & Wallis back in 2002, and found it interesting how various biographers split on whether their relationship was The Romance of the Century or actually a very entitled powerful person throwing tantrums until he got what he wanted. Which is harsh, yes, I know, but there is a reasonable amount of evidence that Wallis really did not want to marry him but ended up backed into a corner due to male tears. My previous I read this due to a combination of low motives; I read a great deal about Edward & Wallis back in 2002, and found it interesting how various biographers split on whether their relationship was The Romance of the Century or actually a very entitled powerful person throwing tantrums until he got what he wanted. Which is harsh, yes, I know, but there is a reasonable amount of evidence that Wallis really did not want to marry him but ended up backed into a corner due to male tears. My previous reading combined with my dark fascination with Diana Mosley and her terrible opinions such that I was really curious to see her take on the entire situation -- especially as she knew the people involved personally. So what was her take? Basically that Wallis loved being maitresse en titre to the Prince of Wales, but did not, in fact, want to marry him, as queen or otherwise. Mosley, of course, sees the thing as something of a tragedy, and hastens to deplore the terrible, terrible behaviour of the royal family towards Edward & Wallis, and to explain that the Windsors weren't really dear friends with Hitler because *she* was friends with Hitler and he would have mentioned them. Which is just -- something -- pretty much the exact something that makes me darkly fascinated. I think it is Mosley's absolute disinterest in the judgement of history or reality; she really does not care what anyone else thinks about her life choices or her relationships, and it carries over into her writing about the Windors. In her version of their life Wallis made the best of a bad situation, as women ought to do, and once she got over the whole Abdication thing she was a devoted wife and Edward was a clingy, dependent, needy husband (as men are, Mosley seems to suggest) and they lived together in peace and harmony, the only thing marring it all is that for some reason the royal family wouldn't invite them back home. This can only be described as very average. I don't know a great deal about this part of English history but I do believe this to be a very sympathetic portrayal of Wallis Simpson and her love, Edward VIII. The author, a personal friend of the Duchess, was always going to gloss over any flaws in this story. She uses Wallis' own memoirs to tell the story of her life, marriages and end. WWII is mentioned, very briefly really, brushed under the carpet perhaps? I must try to find a more balanced bio This can only be described as very average. I don't know a great deal about this part of English history but I do believe this to be a very sympathetic portrayal of Wallis Simpson and her love, Edward VIII. This is not good. Diana Mitford might be interesting to read about, but I'm not keen on her writing here. This is an annoyingly gushing account of a friend, so hardly an impartial look at Wallis Simpson's life. Confusingly written, with huge gaps and other irrelevant information. Also, I thought the many photographs would add something to the book, but they were used so often that it really disrupted the flow of what I was reading. Not recommended. Kindle ebook is littered with typos and formatting issues. Its terrible. Was an interesting read, I found out more about Wallis family and background. The first part was well written and interesting. However the last section was gushing and far more thrown together. There were too many repeats of dull details about the household. Surprised how badly written this was. Biased in the extreme as well. Writing came naturally to Diana Mitford Mosley, whose formidable intellect and extraordinary life resulted in a reams of published volumes: book reviews, memoirs, essays, diaries - even her letters to various friends and relatives had such readability and were of such historical value they were published in volume after volume. 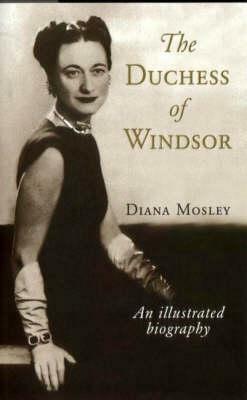 This biography of the Duchess of Windsor, like the author's other works, makes no claim of impartiality - she wrote what she thought, through the filters of her own direc Writing came naturally to Diana Mitford Mosley, whose formidable intellect and extraordinary life resulted in a reams of published volumes: book reviews, memoirs, essays, diaries - even her letters to various friends and relatives had such readability and were of such historical value they were published in volume after volume. This biography of the Duchess of Windsor, like the author's other works, makes no claim of impartiality - she wrote what she thought, through the filters of her own direct experience and famously individualised world view. There were many more academically penned biographies of the Duchess of Windsor, but none by authors who knew her, whose personal life she had been a part of. Such is the value of this contribution to the massive Wallis Simpson canon. I could read anything by Diana Mitford Mosley, having a natural bias for seeing her works in a positive light. The most engaging of her writings, as has been noted by various critics of this biography, are indeed to be found elsewhere. This is perhaps not the book a Wallis Simpson novice reader might turn to for the dry history, any more than being one a novice Diana Mitford Mosley reader might initiate themselves with - it is simply an impassioned addendum to the author's countless other literary contributions and a qualified last word to Simpson's infinite detractors. This piece has the uniqueness of being penned by a longstanding friend, a natural authority on elements of the woman more formal biographers could not capture. Others also wrote from a more negative bias, a key agenda behind this author's wish to set certain records straight about the woman beneath the unkind myths popular history has wrapped her in. Diana Mitford Mosley was renowned for speaking her mind on contentious topics, few topics being more so than the Duchess of Windsor. Being a fan of this author and an avid historian, there was never the faintest possibility of my disliking this biography - though I can appreciate how the uninitiated Mitfordian may find it underwhelming, as may those seeking out meatier documentations of this polarising subject. The touching intimacy of this book's penmanship, with its tributary endnotes, is what sets it apart from less biased Duchess of Windsor biographies. It was almost certainly never meant to be of as much academic value as other Simpson biographies, being pointedly more about setting certain public records straight from an insider's perspective. All these things considered, this book's harshest critics are, in their blinkeredness, simply missing the most fundamental reasons for its existence. It being far from the first Wallis Simpson biography or first Diana Mitford Mosely piece I have read, my expectations were shaped accordingly. I am always up to reading anything written about the Duchess of Windsor, always hoping for a new angle. While I appreciated that this was written by a friend, and kindly biased towards the duchess, disappointingly, there was nothing new to learn. In fact, it was rather hollow in that had I not read other sources, I wouldn't have felt I understood the Duchess of Windsor at all. mergh. This person is not an author. This person did not have an editor. This person did zero research. This person gave a new perspective - but a terribly written perspective. thanks but no thanks. This is written by a friend of the Duchess of Windsor and so it's understandably biased. So if you just want to read one book, this wouldn't be the one. But, if you are looking for more insight into thoughts and motivations, this book does add to the story. It gives insight into why Wallis Simpson was so afraid of flying. Her first husband (a disastrous marriage) was an early airplane pilot and the ‘crash gong’ often sounded on the base. When that happened, use of the telephone was limited so tha This is written by a friend of the Duchess of Windsor and so it's understandably biased. So if you just want to read one book, this wouldn't be the one. But, if you are looking for more insight into thoughts and motivations, this book does add to the story. This biography, written by Diana Mosley, a personal friends of the Duchess of Windsor, seemed much more of a PR piece to present a good image rather than a well-researched biography. I'm not claiming the Duchess of Windsor had any skeletons in the closet, but Mosley glosses over any negative aspects of the Duchess (as stated by acquaintances) and provides mere paragraphs to describe the more controversial aspects of her life. There isn't much new and revealing and hardly any personal quotes from This biography, written by Diana Mosley, a personal friends of the Duchess of Windsor, seemed much more of a PR piece to present a good image rather than a well-researched biography. I'm not claiming the Duchess of Windsor had any skeletons in the closet, but Mosley glosses over any negative aspects of the Duchess (as stated by acquaintances) and provides mere paragraphs to describe the more controversial aspects of her life. I enjoyed reading a biography written by an actual friend of the subject. I feel the content was accurate. The style was neither gossipy or sensationalistic but was an honest rendering. Absolutely terrible, I should have known since it was written by one of her fellow nazi supporter friends. Boring. No interesting information at all. A total whitewash. A waste of my time and money. There are other better books on this subject. Not very well written at all. Slow and quite a few mistakes. Wouldn't recommend at all. Esp as there are some excellent books available about the duke and duchess. Very very uncritical and rather sycophantic, but enough interesting I'd like to read more from another point of view. Got it cheap on a Kindle deal of the day and don't regret it. A different view with new information. Quite interesting and informative on new information. Obviously biased toward the Duchess, but I appreciated the photos.